Home » Blog » Could Your Lifestyle be a Risk Factor for LASIK Success? LASIK is a popular eye procedure sought by men and women who want to reduce their need for eyeglasses or contact lenses. Laser vision correction can provide lifelong benefits. However, LASIK is an elective procedure that should be carefully considered, especially for individuals who lead very active lives. On one hand, the idea of being glasses-free can feel like winning the lottery. 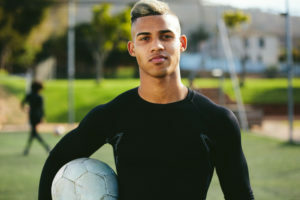 On the other hand, there are certain short-term changes that will need to be made in order to get the most benefit from LASIK vision correction; and if you’re a sports enthusiast, these temporary rules can put a damper on your game. If your sport is running, you’ll be happy to know that LASIK won’t sideline you for long. Even long-distance runners can resume their normal training activities within the first week after their procedure. When they do get back to their normal routine, runners experience the joy of not having to clean eyeglasses or contacts before or after training, or struggling to see if sweat gets into the eyes behind contact lenses. No more stopping to clean glasses due to condensation or sweat, and no more risk of losing or breaking corrective eyewear. Swimming is an activity that will have to be postponed for one month after LASIK surgery. Submerging the head in water presents a risk of infection during the time when corneal tissue is healing. The chlorine in pool water can be extra hazardous to the healing eye because this chemical has a drying effect. Since ocular dryness is already a common side effect after LASIK, we’d like to avoid playing into that as much as possible. Is Contact Sports Your Thing? Many activities can be considered a contact sport. We’re not just talking about soccer or football here. Individuals who play volleyball, racquetball, and basketball are at risk of sudden and unexpected eye injury. If you are considering LASIK and you also play contact sports, it is important to talk with your eye doctor about blade-free LASIK for optimal results. Also, after your procedure, it is vital that you return to your sport with a commitment to protective eyewear. Goggles or other eyewear may not need to be worn forever (but that certainly wouldn’t hurt), but they are necessary equipment for the first month after LASIK. Depending on the level of person-to-person contact in a sport, we may suggest that a particular activity be avoided completely during the first month of recovery. Athletes of all levels can benefit from vision correction with LASIK. Learn more about this valuable procedure by scheduling a visit to our North Canton or Canfield office.